With every year in the 21st century getting hotter than the previous, the question arises if Indian cities are geared up to face the severe summers that loom large. Heat waves across the country have turned out to be silent killers. According to one report from the Indian Meteorological Department (IMD), heat wave casualties are increasing every year and India was worst hit by heat waves in 2015, causing 2300 deaths, making it the fifth highest in world history in terms of number of deaths. But the numbers often go unnoticed. Most of the deaths were concentrated in Andhra Pradesh, Telangana, Punjab, Odisha and Bihar. 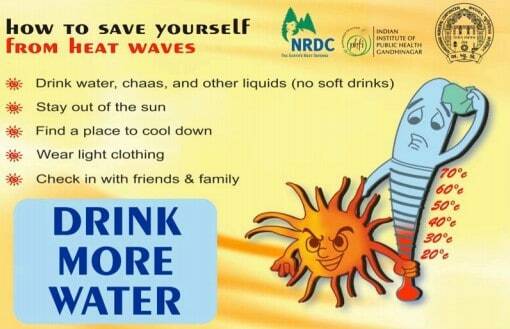 A report from the National Disaster Management Authority (NDMA) points out that heat wave caused 25,716 deaths from 1992 to 2016 in various Indian States. It did not impact just people, but also caused death to an unaccounted number of wildlife, birds, poultry, etc. across the country. The year 2018 too does not indicate respite from heat. IMD has predicted that summer in 2018, will have temperatures 0.5°C to 1°C higher than the long-term average. According to a release from the IMD, during the 2018 pre-monsoon Season (March to May) warmer than normal temperatures are likely in all meteorological sub-divisions of the country. Seasonal (March-May) average temperatures over many of the subdivisions from northwest and neighbouring central India are likely to be above normal by more than 1 degree Celsius. The release stated that normal to above normal heat wave (HW) conditions are likely over the core heat wave zone of the country. The states of Jammu and Kashmir, Punjab, Himachal Pradesh, Rajasthan, Uttarakhand, Uttar Pradesh, Madhya Pradesh, Gujarat and Arunachal Pradesh are expected to face a harsh summer, with spikes in mean seasonal temperatures likely to be greater than 1°C, IMD said. Tamil Nadu, Karnataka and parts of Andhra Pradesh could see temperatures rise between 0.5°C and 1°C from their long-term averages. In spite of death counts shooting up and warnings being issued by various departments, the adverseness a heat wave can cause gained prominence only post 2013, with states and cities in high heat wave zones drafting ‘Heat Action Plans’ (HAP). Leading the way with its Heat Action Plan in 2013, Ahmedabad became the first city in South Asia to come up with a solution helping people to tackle the heat waves. The plan was formulated by the Ahmedabad Municipal Corporation (AMC) in collaboration with Natural Resources Defense Council (NRDC) and Public Health Foundation of India – Indian Institute of Public Health-Gandhinagar (PHFI-IIPH-G) and other partners. Speaking to Citizen Matters, Dileep Mavalankar, Director of the Gandhinagar-based Indian Institute of Public Heath says that Ahmedabad’s HAP uses a simple colour-coded ‘heat alert’ system. The Ahmedabad Municipal Corporation sends out alerts ‘Yellow’ (temperatures between 41.1 to 43 degree Celsius), ‘Orange’ (43.1 to 44.9 degree Celsius) and ‘Red’ (above 45 degrees and considered to be extreme heat alert). A clear communication channel between diverse stakeholders such as government departments, health care professionals, emergency medical personnel, health centre staff, hospital staff and community groups has been formed. Following the forecasting of an extreme heat event, the people are notified immediately through various media. According to Mavalankar, inter-agency coordination among all those participating in the response is critical to ensure the plan is activated. Simple adaptation measures like cooling centres, water distribution and change in work timings further help in coping with heat waves. At the end of summer, the impact of the HAP is calculated based on the data of mortality and morbidity available with the health department. Ahmedabad’s HAP has proved that mortality has reduced to 30 to 40 percent in comparison to deaths prior to 2013, before the HAP was formulated, adds Dr Mavalankar. Taking cues from the Ahmedabad HAP, 11 states and 17 cities across India adopted and started developing HAPs. At the national level, the Indian Meteorological Department (IMD) and Indian Meteorological Society expanded forecasts to over 300 cities. “The National Disaster Management Authority (NDMA) issued ‘Guidelines on Heat waves’ in 2017 prompting different states to develop HAPs and issue advisory advertisements in local languages on television and social media,” says Anup Kumar Srivastav – NDMA Drought, Food Security and Heat Wave Expert. Odisha, Telangana, Bihar, Maharashtra, Gujarat, Andhra Pradesh, Jharkhand, Karnataka, Haryana, Delhi and Uttar Pradesh have demonstrated leadership with locally informed and designed heat action plans and road-maps in 2017. Meanwhile, Madhya Pradesh, Chattisgarh and West Bengal are currently preparing HAPs, Srivastav said. In preparation for summer 2018, a National Level Workshop ‘Preparation, Mitigation and Management of Heat Wave’ was held at Vijaywada on February 21 and 22, 2018. Representatives from more than 17 states participated in this workshop and discussed nuances and fine-tuning action plans as per the immediate requirements of the region. Srivastav adds that every state prepares itself to brace for the heat, months prior to the onset of summer. The effective plans in some heat prone states in 2017 cut death rates due to heat waves at least by half. When do we have a heat wave? Ahmedabad and Telangana piloted ‘Cool Roofs,’ a cost-effective programme that aims to increase heat resilience among vulnerable communities in 2017. 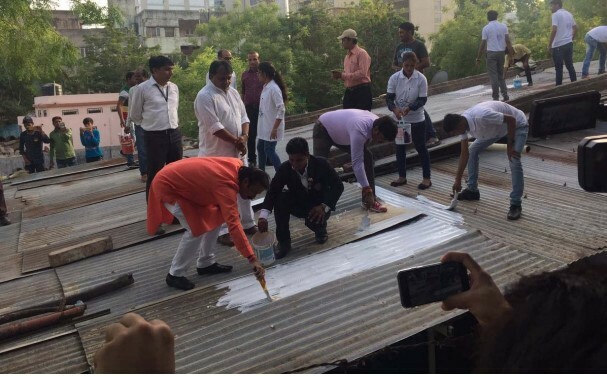 As per Ahmedabad’s 2017 HAP, it aimed to paint 500 rooftops with white paint but they surpassed their own goal and painted 3000 rooftops. In its sixth edition, the 2018 action plan, Ahmedabad plans on expanding cool roofs, painting solar reflective paint on buildings, encouraging gardens on rooftops, increasing access to drinking water and training medical personnel. Andhra Pradesh and Telangana are reported to have the highest number of deaths due to heat wave. As per the figures by Ministry of Earth Sciences, in the last four years India witnessed 4620 deaths of which 4246 people died from the two states. In 2017, the Greater Hyderabad Municipal Corporation partnered with local experts to develop and design a programme to tackle heat waves, starting with over 25 homes in slum communities and measuring the impact. In the last week of April 2018, temperatures in some parts of and Andhra Pradesh touched 42 to 43 degrees Celsius. 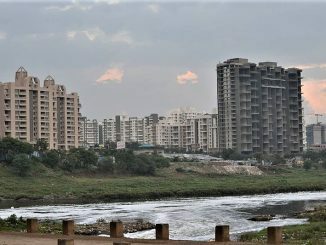 The Telangana State Disaster Management Authority (TSDMA) has constituted a steering committee which includes the Medical and Health Department, Panchayat Department and Rural Development Department and sent alerts using colour codes similar to the Ahmedabad model. The Municipal Administration and Urban Development were instructed to extend duration of public parks and activate cooling centres such as temples, malls, libraries to be open for public. Maharashtra has the most number of city-level HAPs in place and a regional approach in Nagpur was prepared in 2016. In 2017, Maharashtra developed a state-wide heat action plan and conducted regional workshops, designed and published statewide IEC plans (information, education, and communication), modified office, working and exam hours, worked with traffic police, and trained Accredited Social Health Activists (ASHAs) and Anganwadi workers. As per the NRDC June 2017 Report ‘Expanding Heat Resilience Across India’ it is not just at the state level but cities such as Ahmedabad in Gujarat, Nagpur, Gondia, Chandrapur, Nanded, Akola, Jalgaon in Maharashtra, Bhubaneswar, Puri, Koraput, and Baleshwar in Odisha adopted HAPs in 2016 itself. Chandrapur in Maharashtra used Whatsapp alerts and through Whatsapp groups promoted peer-to-peer exchanges, boosted knowledge and learning to accelerate implementation in key cities. In 2017 cities such as Vijaywada/Amravati in Andhra Pradesh, Rajkot and Surat in Gujarat, Hazaribagh in Jharkhand, Rahat in Uttar Pradesh and Hyderabad in Telangana joined the league. 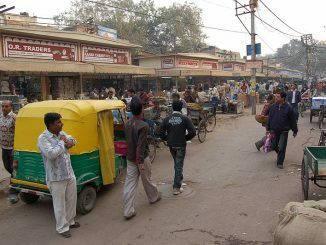 International Development Research Centre (IDRC) Canada in association with Integrated Research for Action and Development has chosen Delhi, Rajkot and Bhubaneswar for its Heat Stress Action Plan (HSAP) project this year. Currently in the first phase, the project will gather evidence and develop spatially differentiated adaptation plans for three cities. The project plan which is expected to be ready by 2019, aims to improve people’s resilience to heat stress, reduce cost of adaptation, improve capacity of city officials, doctors and health care providers, upgrade communication systems within city and state departments and generate knowledge among policy makers. “Keeping a tab on mortality statistics is key to understanding if people are affected due to heat wave. 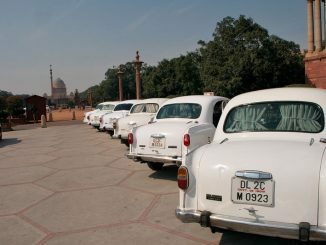 In India, heat strokes are under-reported,” says Dr Dileep Mavalankar. Most of the time, death due to heatstrokes is counted only when a person directly exposed to the sun dies. However, people who are exposed to high temperature, even though not directly exposed to the sun, die and this is known as non-exertional heat strokes (indirect), the incidence of which is ten times higher than the direct. However, these are usually not recorded, he says. Speaking about a study by IIPH-G, Dr Mavalankar says that in 2010, Ahmedabad recorded an average of 100 deaths per day due to all causes. However on May 21, 2010 a day when the heat wave was its peak, Ahmedabad recorded 310 deaths, thrice the mortality rate. This study laid the foundation for the need for a HAP, which was drafted in 2013. If every heat wave prone city observes the mortality statistics, one can get the real picture, he adds.